From Egg in a hole, Toad in a Hole and Eggy in a Basket to Hobo Eggs, it seems that everyone calls this breakfast treat by a different name. But from now on I will call it Egg in a Nest thanks to a comment left on my Flickr photo! An egg tucked into a piece of bread and fried? Prior to 2006, I had never heard of such a thing. The first time I saw it was not in a kitchen but inside a movie theater. Actually, it was in a kitchen in the movie. V for Vendetta to be exact. Of course I didn’t realize that it was something that people actually ate in the real world. It looked very odd and I couldn’t figure out how the egg got into the bread! Of course I feel pretty silly now because it’s so simple to make! Thanks to my friend Nicki for the tutorial! The first time I made this, I used homemade bread and I was able to cut some nice thick slices of bread. The thicker the bread, the smaller the hole needs to be. You can cut the hole with a knife, a small glass, a biscuit cutter, or anything else that you find handy. Or you can just tear a hole out of the center with your hands. It’s up to you, it’s your breakfast! This time around, I used a biscuit cutter to make a fairly large hole because the bread wasn’t very thick. It worked perfectly. I buttered one side of the bread, placed the dry side down in a buttered cast iron skillet, cracked an egg into the hole, sprinkled with a little salt and a lot of freshly ground black pepper and let it sizzle away for a few minutes. From here you can do one of two things. When the egg starts to set, you can carefully flip the bread over and cook it to your liking. Or, you can pop the whole pan under the broiler for a minute or two. This time I chose the latter and it worked rather well. I think I’ll stick with the broiler method from now on! It’s nice to start the day off with a smile so whether you’re cooking for the kids or just tired of another boring breakfast alone, fry up some Eggs in a Nest and have fun! We call them Mexican Sandwiches for some reason. I'm not sure who first showed me how to make them but we enjoy them often, and the piece cut out from the middle is fried beside the rest and is the best tasting bit of all. Looks yummy...my husband made one with a star shape in the middle. I had never heard of it either! Mmmmm, yummy! Love your photos, they make my mouth water. Can't wait to try out your chocolate beet muffin recipe! Eggs in a basket for us too, Connie! Dad used to make these ALL the time for us when we were little. My favorite part was using a glass to cut out the middle, then eating the circle. He would sometimes put a Kraft single on top. Yeah, they are a Toad in A Hole to me. nicole, while i didn't learn about these little devils this year, it wasn't too long ago for me. when i was in college i worked (for a very short period of time) at the chain restaurant Cracker Barrel and they had toad in a hole on there menu. This was the first i'd ever heard of it! you know, to this day i've still never tried it, although i don't really know why, considering how much i enjoy fried eggs and toast! again, you've done a fantastic job of making something so simple look so elegant! egg in a basket in my family. your picture is bringing back fond memories of childhood sunday mornings! "Gashouse eggs" when I was growing up, they were (are) my Dad's specialty, Thursdays, as I recall. I love egg in a hole. You photographed it so well too. Wonder how you got along as far in life as you had without coming across it. :)Love your new header image. I was just looking at a recipe for this! You beat me to it! Hi Nicole, I've never heard about this before, neither seen it. But I LOVE toast and eggs, and can't wait to try it. Thx a lot! this is the only breakfast my dad ever makes! i've been eating this since i was little and love every bite of it. on those special days, my dad even covers the whole thing with a slice of thin cheddar. melty goodness! This was one of my mom's favorite things to make us for breakfast growing up. Very nice photos! Mainers call them Nest Eggs. Very close to your name. Helping prepare my first Christmas meal. Any suggestions? Oddly enough, my mom made me one of those last time I visited. She didnt have a name for it, but she had never made it before. At least not while I lived at home. My dad likes it too, but since he can't eat them a lot because of his heart, he has to wait until I visit so mom will make them. Poor guy.Also, I forgot to ask for one of those "damn sandwiches." Nicole,My childhood name for them was Egg on Toast. I guess it's pretty descriptive and simple, but it stuck for me. Thanks for the reminder of an old favorite, we'll have to do it again soon.p.s. the cheesecake looks appetizing, but I really loved that photo of tomatoes you used to have as your header! Thanks for a great site that I keep coming back to. Your blogs's so cute. Love it! Never tried this till I saw your post. It turned out well. We live off grid so hate to use the toaster, big energy sucker. This solves my toast dilemma nicely. this was my dad's specialty as well-it brings back many good memories especially since he died last year...i make this for my kids now and we renamed it pookie...i don't know why. My kids love this. This may sound like a silly question but do you have to use a cast iron skillet? I went through a phase where all I cooked with was cast iron then I threw them all away! I was so stupid when I was younger because I wish I had them back! This looks very tasty and my Husband would love to eat these on the weekend! Threw away an old cast iron skillet ? :0 Skillet Abuse is punishable in Alabama. We called them nest eggs growing up...haven't had one in years. Sounds yummy! We always called them "Eye of Zeus" although I have no idea where that name came from! me too - first time in the same movie - I mean!Just a nice (yummy) spin on eggs and toast - plus you can munch the bread round while you wait! It looks so tasty!!! Gonna try it the next morning! Thank you, thank you! I had completely forgotten about these things (Toad in a hole, where I came from) The cook used to make 'em for us, working on the boats up in Alaska. Home away from home comfort food. I will revive them for my daughter! Nicole, Congratulations for being such a brilliant blogger/photographer/chef/rad chick! I'm so proud of you and I love the elegance of your blog. Hurray!! 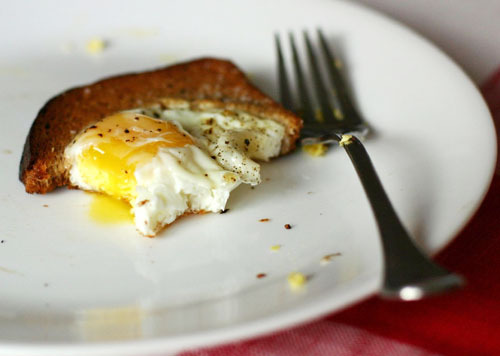 we call them eggs in a basket, and it is easily one of my fav breakfasts! we call them framed eggs where i'm from - been eating these since i was a kid! I've been making this breakfast treat ever since I saw Olympia Dukakis making it in the movie "Moonstruck" for breakfast for Cher. Great romantic movie and gives you a peek about Italian family structure. In the movie, Olympia (who plays the mother) makes her eggs in a basket with Italian bread and puts red peppers on top. Deliciouso! These are bull's eye eggs! They were always called egg in a hat in my family - the cur out hole was toasted on the side and placed on top of the egg for serving - thus the hat! My (Sicilian) mother used to call this "an egg in a frame." I always assumed it was an Italian thing. See how wrong one can be!In the movie "Moonstruck," which is one of my favorite movies, Rose fries strips of red peppers in the pan alongside the egg-bread. Those would be a yummy addition. My family calls this Frogs in a Pond. The cut out centers are toasted as well and dipped in tomato juice. Very quick and nutritious breakfast. The kids love it. I just made this for breakfast and it was delicious! I thought I made my hole too small, because some of the egg overflowed over the bread and down one side, but it turned out perfect. I also did the broiler method. Thanks for the great and quick recipe! I first had these on a camping trip! Why not?! They were introduced to me as "One-Eyed Egyptian Sandwiches." They were always one-eyed egyptians in my family-we used a small glass to push down on the soft bread to make the hole, then fried the little circle along side the toast and egg. Always wondered about the name until about a month ago when, in an inspired flourish, I cut out a triangle instead of the circle and VOILA! a pyramid...... My wife's family called them one-eyed sailor sandwiches-and again used the juice glass to make the circle-the same explanation for the origin of the name applied...... They are a weekly breakfast treat.....and now don't seem so oddly named. My Mom always made these for us, back in the 1950's. She said she got the name "One-eyed Egyptian" from a movie she'd seen as a kid, that she thought starred Douglas Fairbanks. That's the only name I've ever known them as.Nice photos. Thanks. Just had them for breakfast today! Our family has only known these as "one-eyed Frenchman's". Was a term from my Dad, who knows where he got it from. He also had a name for an open faced tuna sandwich that he called "slumgullians". "One-eyed Frenchman's were great growing up an still great today. Passed on down to my 25 year old son, who also had fond memories of these breakfast eggs! Not all Mainers call them eggs in a nest, My step mom use to make them for me when I was a kid and she called them one eyed monsters. egg in a nest - my grandma made this for me back in the 50's. i thought she was the smartest cook in the world! a treasured memory i passed on to my kiddos. The first time I saw this recipe was the movie with Cher - Moonstruck - her mother in the movie was cooking them for breakfast one morning.... I saw that - tried it on my own and it became a personal favorite! I came across your blog and saw this recipe and it really took me back! What a treat! It's so funny that everyone has their own name for this! My family calls it Sunshine Toast...we never discussed it but I always figured it was because the yolk looks like the sun. Very nice. Bunny Down the Hole, or Sun in a Pocket is what I know them as :) My mom made these for my brothers and I when we were little, and I make them now as a perfect late-night study food. I use a shot glass to poke a hole in challah bread or thick italian bread--you find such useful tools in a college student's kitchen., haha. We call them Toad in a Whole. They were my favorite breakfast. My mom use to make them for me all the time. I have tried to pass it on to my family now but it's no big deal to them. Plus it's hard because my smallest has an egg allergy. I love to pop the yolk once its on my plate and spread it over the bread. Mmmm so YUMMY!!! Also we always used the medicine cups to poke the holes. Also I meant Toad in a Hole, not *Whole*. My family always called these Egg Frames. They are my very favorite weekend breakfast! We always put a slice of cheese on top right after it comes off the stove. Delish! We also called them sunshine toast. My grandma would draw two eyes and a smile out of jelly and the egg would be the nose . My sister was a very picky eater and this was fun enough for her to always eat. My husband's family in the same town also called them egg in the nest, so it really doesn't matter where you are from. It's a family thing I guess. We call them bull's eyes. I had actually never heard of these until my fiancee introduced them to me. I usually just did "egg on toast," but this is soo much better! I was raised on these! Mom called them "Eggs Birmingham". I'm 75 and still call them that. So do my kids. I only discovered them recently too. My boyfriend cooked it for me; he calls them egg banjos. I am fully converted to them, especially with bacon alongside. hehe, My parents were making this in the early to mid '70's for breakfast. Gotta love egg-in-toast. Although we make it slightly differently. To further update. we dont toast the bread ahead of time and just use hands to make a hole slightly bigger than the yolk. Butter in the ban put the bread in (minus the part from the whole) let it toast a bit just to get a little color on the underside and crack the eggs into the hole. let it set a bit. add salt and pepper and flip. add a bit more butter since the other side soaked it all up and it nice and crispy brown. then take out when the yolk is set to your desired doneness.In fact my kids made this for breakfast this morning. Easy peasy. I call my recipe Nest Eggs -- made in a skillet w/ canola oil (vs butter), omega-3 eggs, whole wheat bread and drizzled with some pure maple syrup when it's all done. The kids love it, and it's a nice & easy hearty breakfast before they bound off to school. This is one of my favorite breakfasts! In my family they're called "one eyed Johnny" and are always sprinkled with sugar. Whenever I had sleepovers as a kid and tried to convince my friends that the egg and sugar were delicious they always looked at me skeptically at first, but in the end were converted. My dad used to make those for me and always called them Cyclopse Toast. I think it may have just been because he was making it for my brother and me when we were kids, but the name sure has stuck with me! 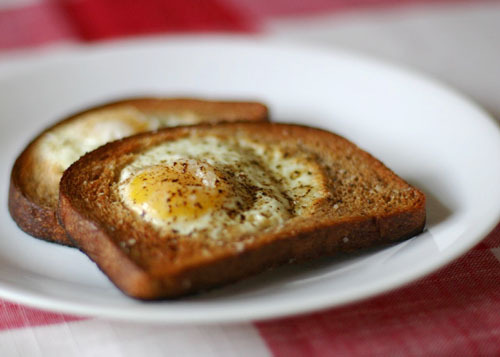 The first time i saw egg in a hole was also on V for Vendetta! My Dad called them Egyptian Eyes or sometimes camel's Eyes, I've posted about them a few times myself... Definitely good eats! I have never seen this before! I feel so betrayed! Love the idea. My hubbie loves his fried eggs on Sat mornings. He is going to really love this! Thanks for sharing! Yummo! Always had them with maple syrup. Ridiculously good. My mother calls them rocky mountains. I always made these for my daughter when she was young. Now she makes them for *her* daughter! We call them Sunny Eggs because the yolk looks like the sun! One Eyed Egyptians was what my father always called them. And he would top them off with sauteed onions and American cheese. My Grandma had been making those for 50 years, and called them "eggs in a nest". But the heart shape was really really cute, and made for an egg-celent presentation on Valentine's Day morning for my husband!! Great Idea!!! I grew up on these things :)They were "killop eggs" (phonetically) in our family. I've heard others around here (New Zealand) call them "egg windows". I feel obligated to chime in now as I have heard a different name for these! My old flatmate used to call it egg on a raft-- I'd argue with her about it because my dad always called it egg in a hole, which I think is more apt. My family called these "One Eyed Mikes". So good!Your posts are great! My mom first gave me "Moonstruck toast" for breakfast about twenty-five years ago. Just this morning I did up a variation toasted in olive oil with shredded cheese and green onions on top. I've thrown just about everything into that hole with the egg and it's fabulous every time. Thanks for the post. Oh thank you. I just stumbled upon your website and made your buttermilk biscuits - fabulous. And who would have "thunk" it - putting the egg under the broiler to finish instead of trying to flip it, have the yolk break, etc. ! You're a genius! Thank you! Years ago at a garage sale I found a chicken shaped cookie cutter, and I use it for making these ever since. Bread has to be a little big to do it. I especially like this with sourdough bread (something I first tried at a Cracker Barrel restaurant). We always called them "Hole In Ones!" Loved reading all the different names! They were called Egg on a Rock at my house, and I have a very distinct memory of when I was 2 years old and my brother came to get me out of my crib and told me that our mother was making us Eggs on a Rock and I was totally confused. My mom would take the 'hole' of the bread and fry it, then put it on top of the finished dish.... thereby making it "egg with a hat on it"
My family called the Love Nests. I've had this before and my friend called it camp-style eggs. it was delicious!! Grew up in the early '60's calling them one-eyed Egyptians. They were also featured in that Cher and Olympia Dukakis (sp) movie, Moonstruck. All I know is I LOVE them. Another whose dear old Dad made these for us as children. We LOVED them and I still make them from time to time. Egg In the Hole to us. We used whichever cookie cutter we fancied that day for the hole and fried up the cut out as well. What is different from others that I've read is that we would fry bacon first, keep it warm in the oven, fry one side of the bread and cutouts in the bacon grease, flip them, break the egg into the hole and cook until the eggs were how everyone liked them. Hardly a low fat dish but they are so YUM. I still make them from time to time, always remembering my Daddy as I'm cooking. These are known as "Egyptian Eyes" in my family. I agree that the separately fried circle is a tremendous treat. Also, I am older and have hand tremors. Making eggs this way ensures that I don't break my yolks while turning it over. We always called these Snake Eyes :D Had this just yesterday. We call them Angels eyes..used to make them often when my children were small. Toad in the hole is sausages cooked in Yorkshire pudding batter to a Brit. One eyed sailor is what ive always called them. Can you bake these instead of fry them? I dont fry. Hi Juliette, They don't really bake well. To bake eggs you need a moist base really like a ratatouille for example. if you're making this for yourself, fold the bread in half gently and just bite a hole in the middle of the folded edge! This is so funny. I just made these for my boyfriend, and he had never heard of them! They were known as One Eyed Swedes in our family, and we had them after midnight services every Christmas Eve with broiled grapefruit. A true act of love is giving up the little, delicious fried circle to someone else at the table. My mom and I call them egg on an island. We usually make the hole just big enough for the yoke fit in then the egg white soaks into the bread. Egg and toast all in one! What more can you want? How to put the egg at the center of bread ? Best food for breakfast.